A great choice for those looking for something a little more modern looking, but wants to keep it simple. This bracelet is made out of stainless steel links that have been IP plated in black to give them a different look, both in color and consistency, almost making it look more plastic than metal. The black ensures that it will look good with any other color, while the links style gives it a very modern look. The bracelet measures at 8.5 inches, with the chain held together by an easy to use fancy lobster clasp and is polished to a high shine. A great gift for the man who likes the more modern, casual look. 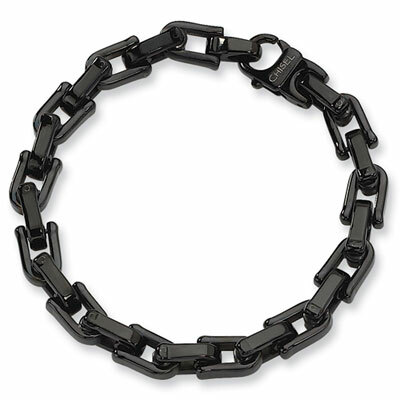 This black IP-plated stainless steel link bracelet is the perfect gift for a young man who has everything. Bracelet measures 8.5 inches in length and is 8mm wide. Ip-Plating or Ion Plating is a colorization process that involves plating the metal with a color, typically black, yellow, rose or chocolate. It involves adding of a titanium nitride layer, which has a high chemical stability, to the component to be plated. It is much more durable than traditional plating methods. We guarantee our Black Stainless Steel Link Bracelet to be high quality, authentic jewelry, as described above.